This just happens to be my favorite birthday-related song at the moment, and it has a nice student-made video. No such details will spoil my plan. Go get them for your kids who are in the appropriate age range. Tell people you know who have kids in that age range that these are important. That's all. Just help deal a major blow to the most pernicious forms of this virus. Yesterday I had an appointment to get a Pap smear. This is a routine appointment for most women. It isn't for me. It was a six-month follow-up to my last test (clear), which was a follow-up to my surgery for cancer in situ last November. It also marks the second birthday in a row during which I will be waiting for more information on my health. A friend noted yesterday, "It's not a Heisenberg cervix; you won't alter it by looking at it. So even if it WAS bad news, that means you can enjoy your birthday without having it hang over your head." It doesn't exactly change the situation, but at least it made me laugh, which I needed by then. I didn't think the Pap was going to bother me. I thought it would be just as routine as any before last year. Some part of me had other ideas. I should have known something was weird when I had trouble remembering I had the appointment. I nearly forgot to get a referral for insurance purposes. I forgot to put it on my work calendar. I scheduled client calls without thinking about whether they'd conflict. I forgot to account for it when planning the number of hours I'd need to work yesterday. I forgot to tell my husband about it at all. It didn't get any better after I had to remember it. About an hour before the appointment, I started to get twitchy. I walked over to the doctor's office using a route I hadn't taken yet. In the elevator up, I remembered the only other two times I'd been to the office. The first was when I'd bled all over the place, due to what I termed "helpful violence." On the second, I was told I needed surgery, although what I was told didn't give me even a hint of what I was in for afterward. I was panting just a little by the time I hit the office. I nearly laughed at the nurse who took my blood pressure, and I didn't bother to find out what it was. There was no point. It wasn’t going to tell anyone anything about the general state of my health. They made a very smart move when they put me in the examination room to wait for the doctor. They gave me a little paper lap robe and made me take my pants off. In the ten minutes or so that I was waiting, that extra step between me and escape kept me where I was. Of course, it also kept me from pacing or doing anything else to burn off the adrenaline. Instead, I looked at the kit for the test. Picture a tapered pipe cleaner on a long handle, about three-quarters of an inch of stiff white brushes, with a small metal paddle at the end for scraping. Next to that is a larger paddle that would look something like a white butterfly if it weren't made of hard white plastic with ridges for more scraping. Once I knew what everything was, I found something else to look at. The doctor turned out to be much nicer than I remember. Fairly sweet guy, in fact. I have no idea what he saw when he walked into the room, but he went from "You'll have your results in just a couple of weeks if everything is fine" to "I'll call you when I get the results in a few days, whatever they are" in about a minute. We talked about the new baseball stadium while I was getting my actual exam. I don't know whether he was being extra thorough because he didn't want to chance missing anything or whether the Pap smears I'll be getting for the rest of my life (most women can stop in their sixties) are just going to hurt and cramp that much. I'm healed from the surgery, but there's less of my cervix than there was the last time I had a "normal" exam, and that was the first time I'd bled from a Pap test. Then it was over and I jittered my way out of there. I was still on the edge of tears, as I'd been for the whole exam, but at least I could move again. Unfortunately, I only had one errand to run, a quick trip to get some chamomile tea to help deal with the cramping. All too soon, I was back at my desk, expected to sit still and work as though nothing out of the ordinary had bitten a big hole in my day, as though nothing had taken out so large a portion of my last year that anything that reminds me of it terrifies me. So why get kids the HPV vaccine, you ask? I'll admit it; part of my answer is that I want to see the bug that did this to me eradicated. I know that's unlikely, though. Still, I'll settle for fewer people having to go through anything approaching what I have. "Did you know that there are people who don't hold hands when they sleep?" "I know. What's up with that?" "Maybe they'll think we're so weird they'll ostracize us, drive us out of society." "Still don't care. I'd rather hold your hand." "Okay, that's pretty weird. But terribly sweet." I am pleased to announce that Hanny & the Mystery of the Voorwerp is now available for free download or purchase in hard copy. Sometimes, as an astronomer, I get to do some really weird stuff. This summer is one of those times. I actually, thanks to project PI (i.e. lead) Bill Keel, got an opportunity to help produce a comic book telling the story of how a Dutch school teacher found the light echo of a once bright Quasar. Light echos, like sound echos, for when waves (in this case light waves) bounce of a surface and reflect back to an observer, arriving after waves that took a more direct path. A man on a cliff may holler, with his initial outcry reaching you in factions of a second, while the reflection of his voice off a distant outcrop of rock may reach you a few moments later. Trying to figure out that a random green blob of gas is a light echo was anything but easy. In this comic book, we try and tell the story of what it was like for the people involved and how exactly astronomy – in its not exactly Indiana Jones fashion – can be an amazing adventure. Workshop: Hanny finds the Voorwerp and goes to wise astronomers to seek knowledge, but is told she has found something new and magical, and is sent to discover the true nature of the object. Join our band of writers and illustrators as we chronicle Hanny's journey. 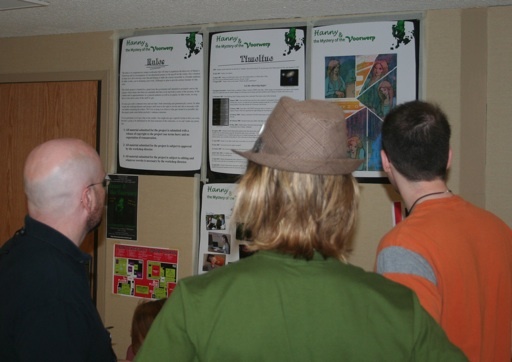 At CONvergence, we took part in several panels (there’s even photographic proof of the back of my and Kelly’s heads!) with Kelly McCullough, author of the WebMage series and all-around stand-up guy, the enthusiastic and incredibly sweet Dr. Pamela L. Gay, and the immensely knowledgeable Bill Keel, discussing how to go about turning the discovery and investigation of Hanny’s Voorwerp into a web comic in order to provide a manner of outreach, bringing the obvious human interest aspects of the story to the public. As it turns out, by doing so, we volunteered to help co-author the web comic. Not that I wasn’t absolutely honoured by the fact! So we wrote several of the pages’ dialogue to help shoulder some of the burden, then Kelly gave them all a going-over to ensure we were all “on the same page”, so to speak. And for what minimal amount of effort we put in, we got a co-writing credit on the front page of the comic. Me? Well, I had nothing at all to do with it. I just think my friends got together and produced something both truly awesome and beautifully inspiring, inspiring in a way more things should be. So go, check out the comic, and consider passing it around to others, both as inspiration for more involvement in science and as inspiration for ways to get yet more people involved. I wasn't terribly concerned over Joseph Ratzinger's election to pope simply because he had a Nazi past, having been part of the Hitler Youth. He was, after all, quite young at the time. That he didn't make the hard choice to oppose the government of his time was not exceptional, a fact that undermined any claim to a particular inherent virtue in the new pope but didn't make a case for inherent evil either. That case was made by Ratzinger's adult behavior. His regressive attitude toward his predecessor's humanitarian gestures and his emphasis on authority over forgiveness on the subject of HIV and condoms told me all I needed to know about this new pope. Later revelations about his role as enforcer in keeping the church's predatory scandals quiet weren't a surprise. Not from Benny the Rat. Now, however, Ratzinger seems to be reaching back to embrace his Nazi past. Yes, I'm quite serious. What else can you call his recent statement about atheists? “Even in our own lifetime, we can recall how Britain and her leaders stood against a Nazi tyranny that wished to eradicate God from society and denied our common humanity to many, especially the Jews, who were thought unfit to live,” he said. “I also recall the regime’s attitude to Christian pastors and religious people who spoke the truth in love, opposed the Nazis and paid for that opposition with their lives. Charles Johnson at Little Green Footballs rightly calls it revisionism. Beyond that, it is revisionism that parallels what Ratzinger has seen before, in his formative years. Jews may not be acceptable targets in most of the civilized world at the moment (I wish I could say, "anymore"), but atheists are still subject to open and unapologetic religious discrimination even from sects and authority figures that consider themselves religiously liberal. It is perfectly fine to suggest that our moral character is inherently defective, despite evidence to the contrary. It’s almost trendy to characterize our open, unashamed, sometimes opinionated existence as an attack on others. Our very lack of invisibility is considered a problem. Nor is the problem just that the pope is exploiting the uncertainty of our times. He is doing it as the head of an institution that bears direct responsibility for many of our global problems. Don't know what I'm talking about? Turn away from your comfortable "First World" life for a moment and think about what the promotion of poverty, disease, overpopulation and submissiveness means to our world, both in general and specifically in building tensions between the have-littles and have-nones. This tension is a political force that should never be underestimated, particularly in its power to destroy. Yet Ratzinger not only fails to take responsibility for the actions and policies of his institution, or for the power that gives them such far-reaching effects. He also deflects this responsibility onto atheists, an unorganized group without anything like the power to create the phenomena for which he blames them. Atheists, denied social influence by virtue of their atheism--and political power in many places, can no more be specially responsible for the world's problems than the Jews of Germany could be responsible for the failures of the German government. They can, however, serve as a scapegoat for a leader who wants power without the responsibility that should come with it. Of all the current political and religious leaders in our world, Ratzinger has the fewest excuses for claiming ignorance as to where that can lead. Ratzinger was a child when he participated in the Hitler Youth. He shouldn't be held responsible for what he supported then, although a truly moral man might claim that responsibility despite his immaturity at the time. We are, after all, none of us ever truly mature, and it's the repercussions of our lingering immaturities of which we should be most aware. Benny the Rat is no longer a child. He is an adult of an age to have seen the Holocaust first hand and remember its lessons. That he has said what he has said under the circumstances in which he said it strongly suggests that he is embracing those lessons. It is appalling that he can remain the head of an institution with any power at all when he is so clearly embracing the wrong ones. Life is keeping me a wee bit busy these days. In the course of a week, I did a guest lecture on religious skepticism and made my return to Atheists Talk radio. Mike Haubrich is doing hostly duties these days, so I get the leisure of interviewing fun people from time to time while mostly sleeping in on Sundays. This past Sunday, Jason and I got up early to talk about arguing over astrology and what does and doesn't constitute scientific evidence. Who says online arguments are worthless? All right, so it probably depends on what you’re arguing about and who you’re arguing with, but even arguing with a bunch of astrologers over whether there’s any proof for astrology can teach you something. If nothing else, it can teach you how not to construct a valid argument over scientific evidence. Join Jason Thibeault and Stephanie Zvan as they discuss what evidence there is for and against astrology, what evidence would be required to prove astrology, and what might happen if astrology were proven true. What if astrology WERE true? Now, Jason was a little bit (!) nervous about the show, as he hadn't done any public speaking in over a decade. So I didn't post anything ahead of time. However, he did a grand job (just like everyone I agree to have on the show with me) despite some sound issues with the international call, so go check out the podcast. And while you're there, check out what Atheists Talk has been up to since its rebirth. I'm loving this video. For once, the entire internet understands what heights look like to me. Sooo nice to not be the only one. Update: Noooo! Not fair. They took it down. Something about giving the industry a bad image or something. Although, how any industry involving heights can have a good image is beyond me to start with. Ah, well. Try this one instead. I generally agree with PZ Myers on the topic of Crackergate, but he has a post up today that makes me wonder a little whether he's forgotten exactly what he did. He's defending, by analogy to his own actions, the burning of the Koran that is scheduled to take place in Florida this weekend. I understand that he's reacting to some statements that protest the proposed burning on ridiculous grounds. However, I don't think that's any excuse for underestimating the thought that he put into throwing a communion wafer (or whatever the exact appropriate terminology is) in the trash. PZ didn't just throw away a cracker and a rusty nail. He also included pages from the Koran and Dawkin's The God Delusion. Those were critical to conveying his message that the authority claimed by the church was the problem, as is any authority, religious or secular, that can't provide external justification for its actions. Admittedly, many people weren't and still aren't capable of understanding that, but that doesn't change the fact that those pages were important to what he did. Nor did he just post a picture of his trash can. The "offending" picture was accompanied by a history and explanation of blood libel--one cost of the authority of the church to those over whom it claimed that authority. Beyond that, the whole brouhaha occured in the context of the church exercising its authority over someone without consent. That was the message I supported and still support. That is not the message coming out of Florida. Jones will not undermine his own authority in order to call the authority of the Koran dangerous. In fact, he is claiming the authority for his actions comes from his god, and burning the authority of another is only intended to raise him further. This authority allows him to call Islam the "devil's religion," making believers not misguided equals or the blindly privileged, but a dangerous minority who are a threat not for what they do, but for who they are. And we know how that works, or we should. That isn't a sloppy version of what PZ said much better. It's an entirely different animal, whether or not believers can't see the difference. I would hope that the rest of us can. I'm delivering a guest lecture at a local community college this evening on religious skepticism. The following is a bibliography of further reading on the main topics I'm covering. Please feel free to add more in the comments. Updated: A big thank you to the students for your time, attention, and some excellent, fearless questions! If you want more information on something we talked about, please ask in the comments. At the Committee for Skeptical Inquiry, Steven Novella and David Bloomberg differentiate scientific skepticism from other modern definitions of "skepticism" and discuss untestable religious claims. Theopedia discusses the problem of "God of the Gaps" apologetics. One bible school points up the "dangers" of several versions of the Bible that claim to be inerrant. John Wilkins of Evolving Thoughts delves into definitions of agnosticism and what can and can't be known of the existence of god(s). Doubt: A History: The Great Doubters and Their Legacy of Innovation from Socrates and Jesus to Thomas Jefferson and Emily Dickinson (book) and an interview with author Jennifer Michael Hecht on NPR's Speaking of Faith.